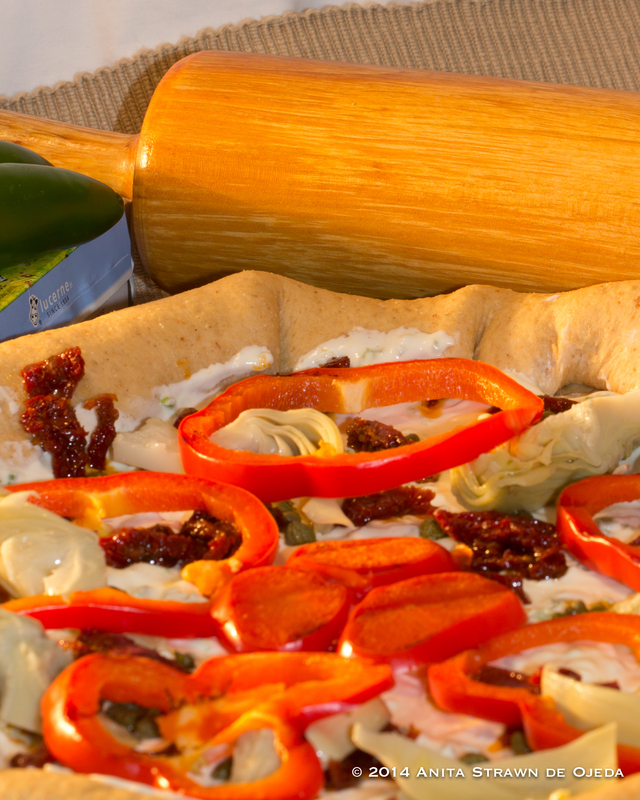 I remember the first time I ordered a gourmet vegetarian pizza in Mexico, at a popular pizza joint in Ensenada. When we asked the waiter if they served a vegetarian pizza, he shrugged, gave us an odd look, and nodded. Thirty minutes later, he returned and placed a pizza on our table with a flourish. I almost gagged. It was a vegetarian pizza, all right. Traditional pizza sauce with a bag of frozen veggies dumped on top with just enough mozzarella to thinly disguise the lima beans (which I hate), carrot squares, peas and green beans. NOT my idea of the perfect vegetarian pizza! Jalapeños on your pizza? You bet! Start a #fiesta in your mouth! #vegetarian Click To TweetThis recipe will please even the meatatarians in your family with the fiesta of flavors. From the whole-wheat crust, stuffed with spicy jalapeño sauce, to the medley of toppings, this pizza is anything but ordinary. If you’re mixing by hand, you should now be able to transfer the dough to a floured surface and start to knead it and incorporate more flour–about 1 1/2 additional cups. If you’re mixing in a mixer with a dough hook, just keep adding flour (about 5-6 cups total, depending on what brand of flour you use) until the dough no longer sticks to the sides of the bowl. Knead for 8 minutes and then cover with a towel and let raise until doubled in size (about an hour). Sauté the diced jalapeños in the teaspoon of olive oil over medium-low heat until they are soft. While the jalapeños are sautéing, heat the water in a large glass bowl and then add the Neufchatel cheese and microwave on high for 30 seconds. Stir the water and Neufchatel mixture until it’s relatively smooth (you may need to microwave it for an additional 30 seconds). Add the salt and the jalapeños and mix well. Set aside. 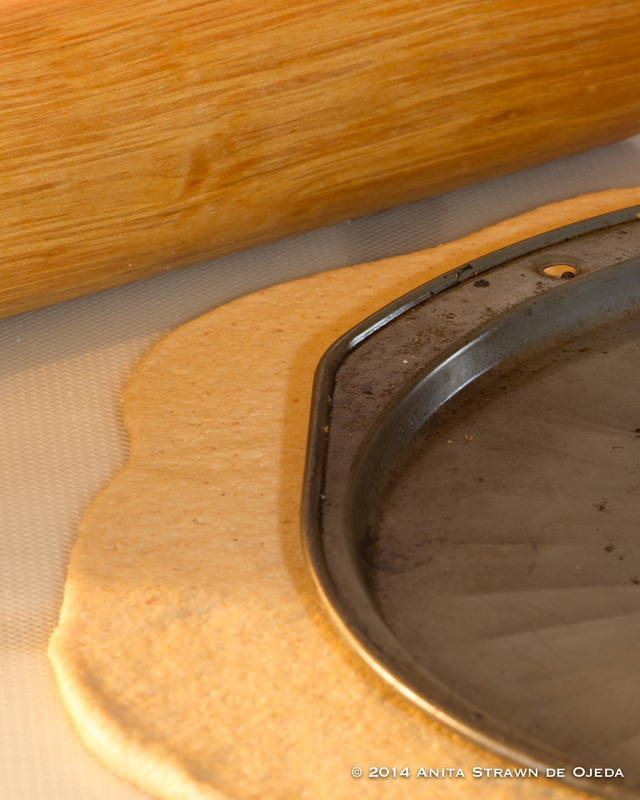 Once the dough has doubled in size, divide it equally and roll each ball of dough into a circle that is about two inches bigger than your pizza pan (my pizza pans are 13 inches in diameter). 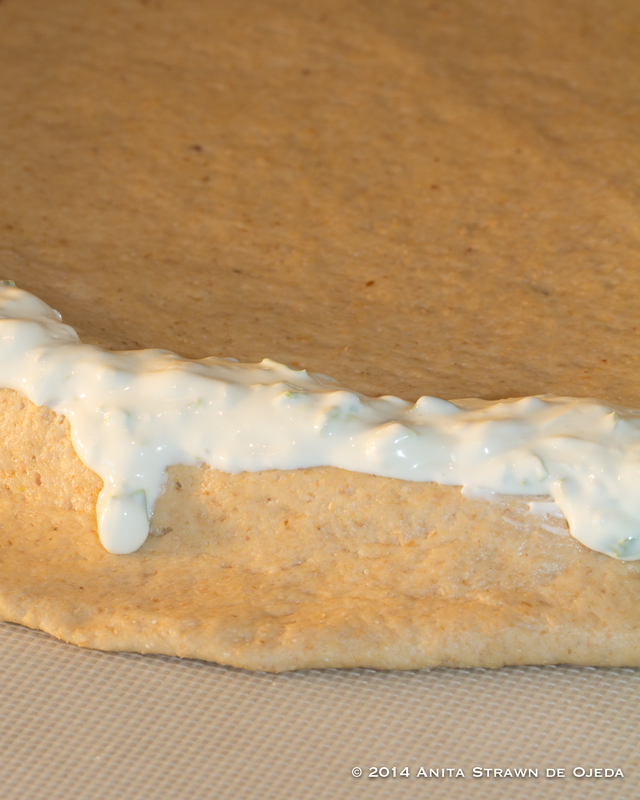 The vital wheat gluten adds more protein to the dough, and keeps it soft and fluffy. Stuffing the crust ensures that the pizza pleases to the last bite! Place the pizza dough on top of the oiled pizza pan (I used a light coating of olive oil), and then press the dough down around the inner edge of the pan before using a teaspoon to drizzle the jalapeño sauces around the edge of the pizza. Fold the pizza crust up over the circle of sauce, and lightly press the edge to the bottom crust. Fold the pizza crust up over the circle of sauce, and lightly press the edge to the bottom crust. Now it’s time to add the toppings. Spread about 1/2 cup of the jalapeño sauce on the bottom of the pizza, think sprinkle two tablespoons of drained capers on top of that. Add 1/2 cup of sun-dried tomatoes, 1/2 cup of marinated artichoke hearts and 1/2 of a red pepper (I sliced it in thin slices and grilled them on my Foreman Grill). Sprinkle about 1 1/2 cups of mozzarella cheese on top of everything and bake in the oven for 20-25 minutes at 400˚.